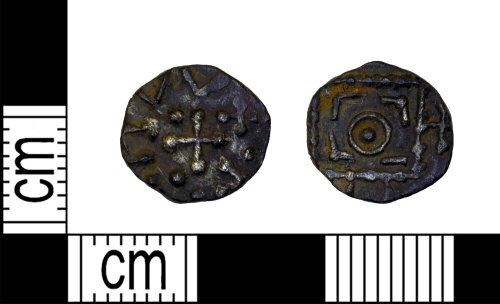 Early Medieval silver Sceatta, The coin is an Abrahams Standard series D type 8, which matches eg. D120, dating to 700-715AD. Obverse description: Beaded standard enclosing three right angles and a line and pellet around a dot in circle. Reverse description: Central cross pommee with pellets in angles and chevrons in corners. An Early medieval Anglo Saxon silver sceat. Continental Series, Series D. Abraham sub group 3 with standard with linear elements. C. AD 700-715. A debased silver sceatta, Series D (type c2), dating to 700-715 AD.